View from a ferry in winter. The Lake Champlain Transportation Company agreed to pay $100,000 in penalties and to take steps to minimize air emissions to settle claims that it violated clean air laws, the Environmental Protection Agency announced Monday. The company, which operates a ferry service on Lake Champlain between Vermont and New York, used paint with hazardous pollutants on its ferries, failed to keep records of using the paint and failed to submit required reports to state and federal officials, the EPA alleged. Regulators also alleged the company failed to obtain necessary permits when it acquired new paint spray guns, used for coating its ferries during maintenance operations, in 2005 and 2009, the EPA said. The company, owned by Burlington's Pecor family, operates ship repair and painting facilities in Burlington and Shelburne. 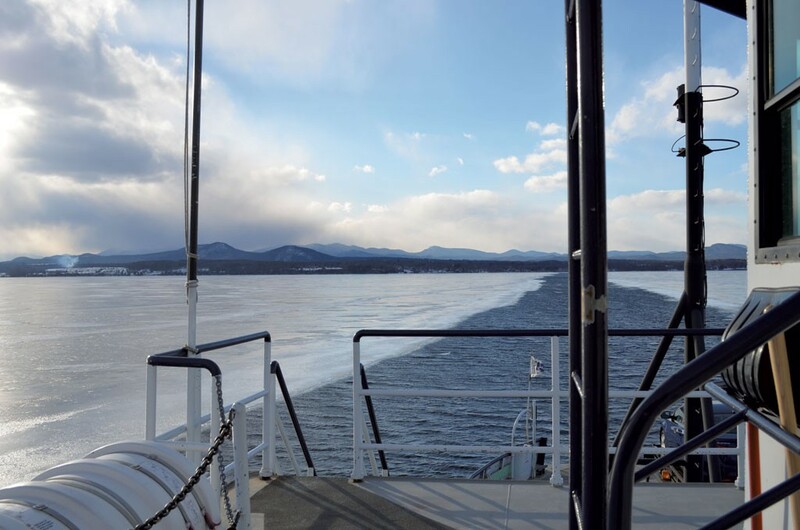 Lake Champlain Transportation Company said it has already hired a consultant and taken the first steps to coming into compliance with the applicable laws. "LCT is fully cooperating with the EPA in resolving our non-compliance issues as it relates to record keeping and permitting requirements," it said in a statement. LCT Operations Manager Heather Stewart said the violations involving the paint gun stem not from using the tool more than allowed, but rather from failing to document its use. The paint contained hazardous pollutants that can damage lung tissue and is especially dangerous to the young and elderly and people with lung disease and asthma. The company will also have to submit written plans to the EPA to outline how it will comply with federal regulations in the future, and will apply for a permit from the Vermont Department of Environmental Conservation, the EPA said. Mark Davis is a Seven Days staff writer.